Designed by the leader in power add on drives, the Alber e-pilot transforms a manual wheelchair into a sporty vehicle in just a few simple steps. 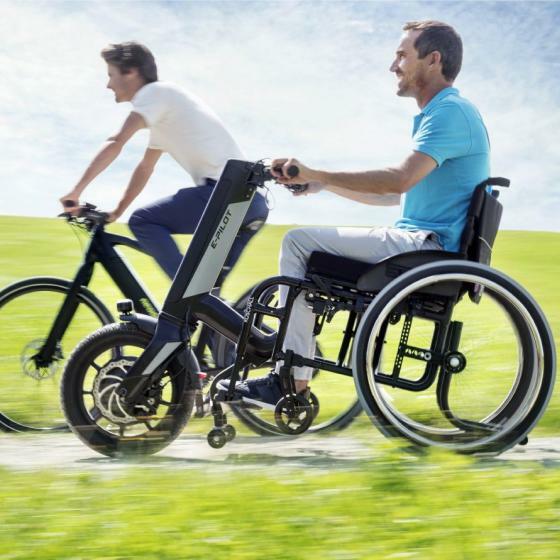 Choose between using your manual wheelchair as standard, or simply attach the e-pilot, connect to your smartphone and access the smart features to go further and faster. Long or short journeys, the elegant integrated lithium-ion battery pack gives maximum flexibility with more range up to 50km. The Sleek e-pilot has been designed for its speed and looks in mind. Taking mobility to the next level. Designed by the leader in power add on drives, the Alber e-pilot transforms a manual wheelchair into a sporty vehicle in just a few simple steps. Choose between using your manual wheelchair as standard, or simply attach the e-pilot, connect to your smartphone and access the smart features to go further and faster. Long or short journeys, the elegant lithium-ion battery pack gives maximum flexibility with more range up to 50km. It also allows the ability to master everyday obstacles such as kerbs or cobblestones with the strong, efficient front wheel and powerful drive. 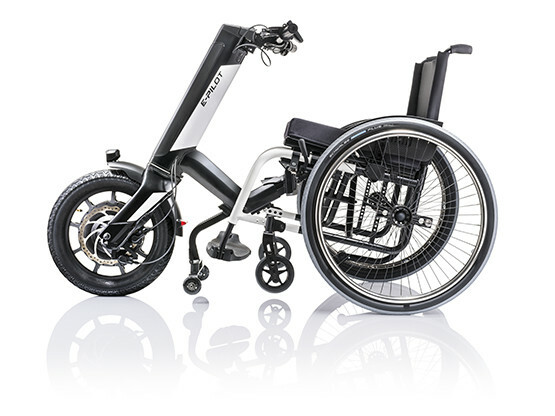 Ideal for those using active wheelchairs seeking a convenient, comfortable and effortless solution to pursuing and maintaining active lifestyles. 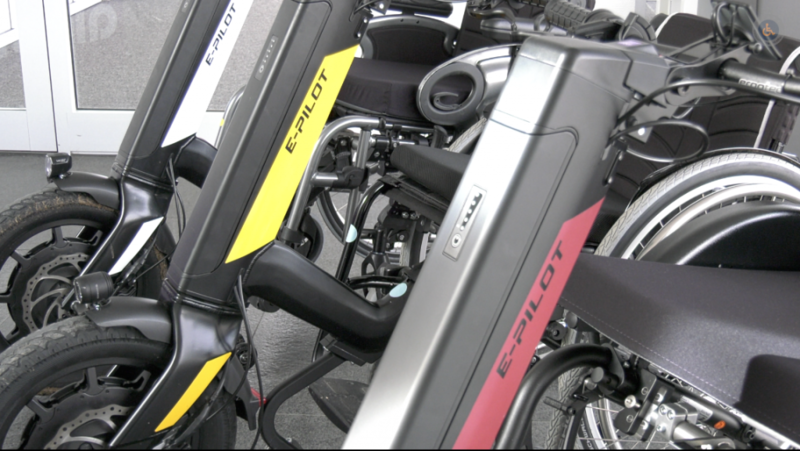 The e-pilot hand bike will take you further and go faster, offering a fantastic way to enjoy any outdoor activities. Experience more with the Mobility Plus Package. With the Mobility Plus Package & App, individuals can get to their destination quickly and efficiently with a range of useful features. Connect the e-pilot to a smartphone to take advantage of EasyNavi - the wheelchair-friendly navigation system, a speed increase of up to 20km/h as well as the cruise control function for an effortless, comfortable drive experience. Rear Mirror - For fixing to the left handle bar but is not comparable with the throttle handset. Tail Light - Fits to wheelchair push handles.Uses 2 x AAA batteries and has a running time of 50 hrs. Shopping Bag - Dimensions 35 x 28 x 26cm. Supernova Front Light - Double light output compared to the standard light. Extra bright with 205 lumens. Parking light up to 5 minutes after switching off. Please contact our customer services team on 01642 805050 / enq@activemobility.co.uk for further information. 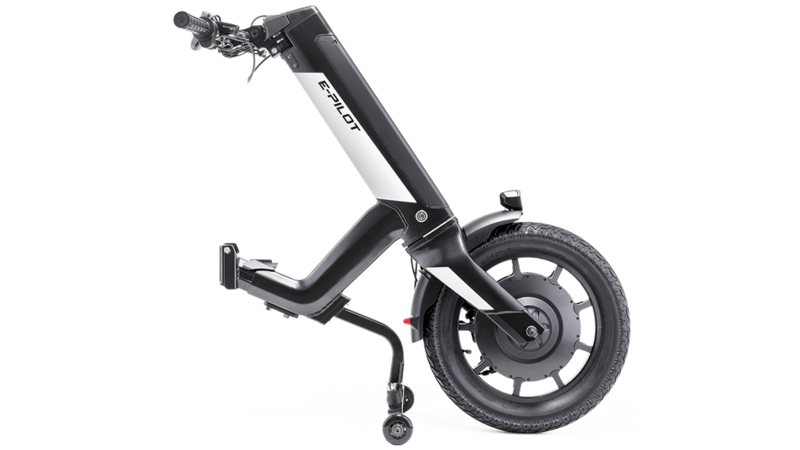 I purchased this item after a lot of research , and phone calls to Active Mobility asking a hundred and one questions on this product ! I purchased this initially to enable me to take my dog out for a good run myself rather than relying on others, this exceeds my expectations and its amazing for the use intended, across fairly uneven terrain. The speed when in top speed is very impressive and would give the guys on Top Gear a run for their money ! I have found myself using this a lot more now than I anticipated due to the ease of use and ease of clipping on and off my chair. I ordered mine with the lights as I think this is a must for safety if going out on dull days due to the speed you can go when using this. This has totally transformed my life and I cannot recommend it enough. A big thanks to the staff at Active Mobility for their patience and knowledge too .